In a medium bowl, toss together the apples, cinnamon, agave nectar, and lemon juice until the apples are completely coated. Spread the mixture over the prepared baking sheet. Bake the apples on the center rack for 35 minutes, rotating the sheet 180 degrees after 20 minutes. The apples will be soft. Preheat the oven to 325°F (160°C). Lightly grease a 7 x 4 x 3-inch loaf pan with oil. In a medium bowl, whisk together the flour, 1 cup of the evaporated cane juice, and the potato starch, arrowroot, baking powder, baking soda, xanthan gum, salt, and 1 tablespoon of the cinnamon. Add the oil, applesauce, vanilla, and 1 cup of the hot water to the dry ingredients. Stir until the batter is smooth, then fold in the roasted apples. Transfer 1/4 cup of the batter to a small bowl, and add the remaining 1/4 cup evaporated cane juice, 1 tablespoon cinnamon, and 1/4 cup hot water. Stir until creamy. 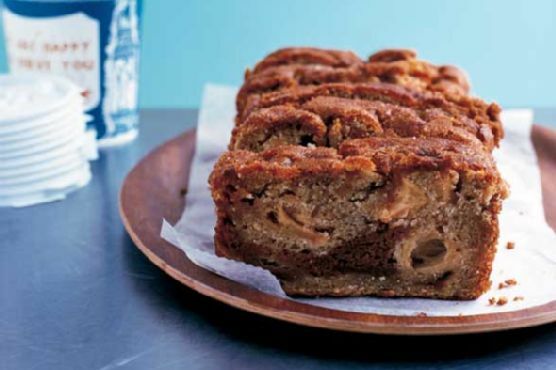 Pour the apple batter into the prepared loaf pan. Carefully drizzle the batter from the small bowl down the center of the loaf. Use a teaspoon to swirl the topping into the loaf, moving the spoon up and down. Sprinkle the top with evaporated cane juice. Bake the toastie on the center rack for 25 minutes, remove from the oven, and brush the top with a generous amount of oil. Return to the oven and bake for another 15 minutes, until crunchy and a toothpick inserted in the center comes out clean. Let the toastie stand in the pan for 20 minutes, then invert the cake onto a board. Turn right side up and cut and serve warm. Cover the cooled uncut toastie with plastic wrap and store at room temperature for up to 3 days.